Modern Automotive Technology details the construction, operation, diagnosis, service, and repair of late-model automobiles and light trucks. This comprehensive text uses a building-block approach that starts with the fundamental principles of system operation and progresses gradually to complex diagnostic and service procedures. Short sentences, concise definitions, and thousands of color illustrations help students learn quickly and easily. The text provides thorough coverage of the latest developments on the automotive field, including OBD II diagnostics, enhanced emissions testing, misfire monitoring, air bag systems, anti-lock brakes, and security systems. Organized around the eight ASE automobile test areas, this text is a valuable resource for students preparing for a career in automotive technology, as well as experienced technicians who are preparing for the ASE Certification/Rectification Tests. The Instructor's Resource CD is an exciting addition to the Modern Automotive Technology teaching package, combining the entire contents of the Teacher's Resource Binder and the G-W Test Creation Software in a single, easy-to-use CD-ROM! With the Instructor's Resource CD, you will have instant access to literally hundreds of useful resources, ready to be output to your laser or inkjet printer as you need them. 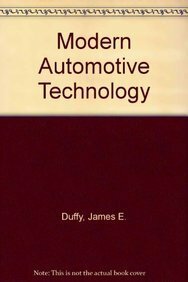 James E. Duffy has written many of the top-selling automotive education textbooks on the market today. He is also a noted videographer who has produced over 100 vocational/technical video programs. He possesses a B.S. in industrial electronics and a B.S. in technology education from Indiana State University.